Situated between the scenic Puget Sound, the pristine Lake Washington, and the Pacific Ocean, Seattle is the fastest growing city in the country and has the fourth largest port in North America with an emphasis on trade with Asia. Balancing the surrounding beauty of nature with the thriving gateway for trade has been successful for well over a century now. With its rolling hills, beautiful ocean views and the iconic cityscape, Seattle is becoming popular with tourists as well. Visitors will find top-notch entertainment, original music, sightseeing, museums, and activities in the surrounding natural areas a great combination. Round-trip route with on/off privileges in Seattle City! Easy to use system map of the Seattle! Audio narration onboard the bus! A total of 14 Bus stops at the must-see sites! Free Audio Guide Walking Excursion (not mandatory)! 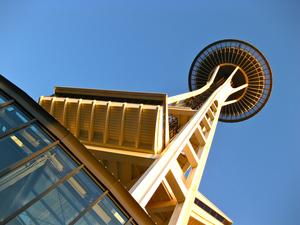 Explore the colorful city of Seattle on a City Sightseeing bus tour with a 1 day or 2 day ticket. Passengers will have access to 14 conveniently placed stops, where they can hop on and hop off at their own pace to discover sights including the Space Needle and Puget Sound!